When opportunity knocks, open the door and let it in. Make it happen. Life (and business) presents itself with golden opportunities and if they are not acted upon…..well, it’s gone, and regret sinks in. Case in point is Iveco with the newly extended range of 4×4 utility options within its award winning Daily range. Here-to-fore Mercedes-Benz dominated this specialist market with the long serving Vario, which is now out of production. At the heavier end, Mercedes-Benz has the Unimog. Other than that, the Fuso Canter 4×4 is the only other main competitor. So, Iveco sees great potential with its Daily 4×4. 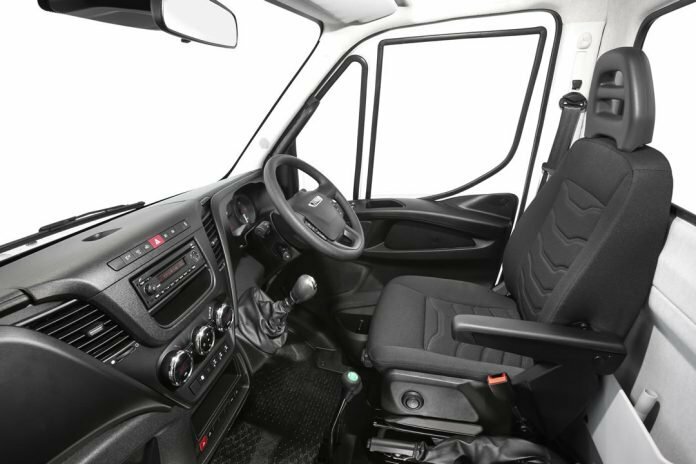 Now catering for two weight categories – 3.5 tonne and 5.5 tonne GVW, Daily 4×4 is available either with a standard 3-person cab or 7-person crew cab, with two wheelbase lengths (3,050mm & 3,400mm) for the former. All options are powered by Iveco’s 3.0 litre Euro 6 diesel that produces 170hp and 400Nm of torque. The 6+1-speed manual gearbox has up to 28 gears, when the 4 low ranges are applied. On-road or Off-road tyres can be specified. The 4×4 is built on a much higher platform than the standard Daily, due to its specially developed off-road chassis frame, but with the same cab design. A few coats of amour are attached, such as the three piece steel bumper that can take hard knocks and is designed for easy repair, while the fuel tank is well protected and the rear under-run protection bar folds up. Stepping into the 55S17DW 5.5 tonne crew cab version while on a test session at Millbrook Proving Ground in Bedfordshire was different with an extra external step fitting to aid getting on board. A grab handle on the B-pillar would not go amiss here, which was noted by Mark Hank, Iveco’s demo driver. Not much else is changed inside the cabin other than the extra gear lever and higher centre of gravity when driving. The on-road section took in the journey from Luton Airport to Millbrook, which was comfortable enough with its strong suspension and comfortable driving seat, but required a firm hold of the steering wheel at times over the bumper sections! On a cold frosty foggy morning Daily 4×4 proved its worth out on the battlefield. Mainly thanks to its selectable 24+4 gears with crawler and three different wheel locks, it’s outstanding climbing, while when descending hill control ensures that there is literally no place out of reach with the Daily 4×4. Due to its wide approach and departure angles, any terrain can be tackled. We tried everything that Millbrook could throw at it and Daily 4×4 emerged chest beating! To protect the electric fan when wading though deep water, it is advisable to turn it off manually through a switch on the dash. The new chassis frame accommodates a broad range of specialist bodies and ancillary equipment and for real off-road duties there are Power-Take-Off options both on the transfer box and on the gearbox. The front fixing plate is standard. Iveco is targeting utility and service providers in the main with the Daily 4×4 as a good value for money all rounder. From the day long exercise, it could not be faulted. Opportunity knocks, opportunity taken!